Matrox Design Assistant 5 flowchart-based vision software for 64-bit Windows 7/8.1/10. Includes DVD with integrated development environment (IDE) and on-line documentation. Also includes one (1) USB hardware key for licensing design-time and run-time environments (for Bead Inspection, Blob Analysis, Code Reader, Color Analysis, Edge Locator, Image Processing, Intensity Checker, Measurement, Metrology, Model Finder, Pattern Matching, SureDotOCR, String Reader, calibration, I/O, communication and GigE Vision® and USB3 Vision™ camera interfaces), as well as a Matrox Design Assistant maintenance registration number. Included in the original purchase price of the Matrox Design Assistant development package, it entitles registered users to one year of technical support and access to updates. "Matrox Design Assistant environment" training. 2+ day instructor-led training. Visit Matrox Imaging website for more information. Refer to MIL datasheet - MIL10 Run-Time Licenses section. Note that Distributed MIL package license is required on a third-party PC in oder to connect to it remotely from the design-time environment. Contact Matrox Imaging or your local representative for more information. MILXWINPU MIL 10 development tookit for 32-bit Windows® XP/7/8.1/10 and 64-bit Windows 7/8.1/10. Includes DVD with MIL, Matrox Intellicam, Matrox Inspector (32-bit), Matrox display drivers and online documentation. Also includes one (1) license USB hardware key and MIL Maintenance registration number. MILXLNX MIL 10 development toolkit for 32/64-bit Linux. Includes DVD with MIL and online documentation. Also requires MILXWINPU. MILLITEXWIN MIL-Lite 10 development tookit for 32-bit Windows XP/7/8.1/10 and 64-bit Windows 7/8.1/10. Includes DVD with MIL-Lite, Matrox Intellicam, Matrox display drivers and online documentation. Also includes MIL-Lite Maintenance registration number. 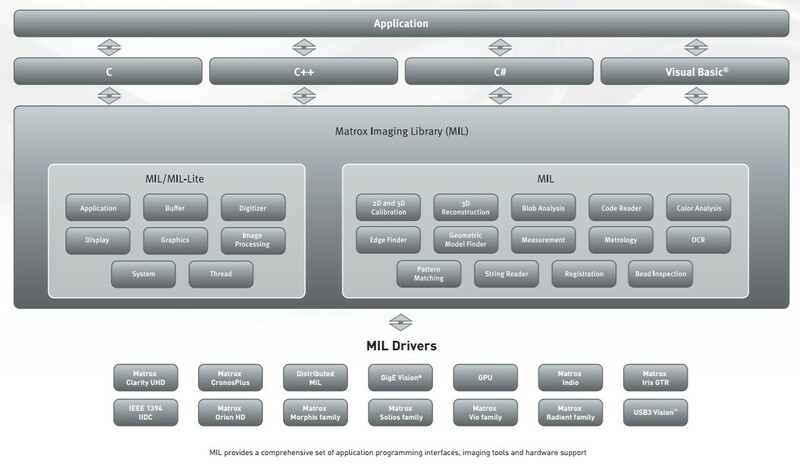 MILLITEXLNX MIL-Lite 10 development toolkit for 32/64-bit Linux. Includes DVD with MIL-Lite and online documentation. MILMAINTENANCE One year extension to the MIL maintenance program per developer. LTEMAINTENANCE One year extension to the MIL-Lite maintenance program. MXRTxxxxxxxx00 MIL 10 run-time software license key. The user must supply a lock code generated using the appropriate MIL utility/page. This unique lock code identifies the target computer system and MIL package(s) to license. Note: Combine packages by substituting 0 at the appropriate position x with the appropriate letter or other digit. MXRTA000000000 MIL 10 image analysis package. Includes Image Processing, Blob Analysis, Bead Inspection, Measurement and Calibration modules. MXRTM000000000 MIL 10 machine vision package. MXRT0I00000000 MIL 10 identification package. Includes OCR and Code Reader modules. MXRT00J0000000 MIL/MIL-Lite 10 image compression package. Includes JPEG, JPEG2000 and H.264 codecs. MXRT00T0000000 MIL/MIL-Lite 10 GPU Processing package. Requires appropriate additional package(s) if used with MIL (i.e., not required for MIL-Lite). MXRT000G000000 MIL 10 Geometric Model Finder package. MXRT0000S00000 MIL/MIL-Lite 10 interface (GigE Vision®, IEEE 1394 IIDC and USB3 Vision™) package. Required if using a third-party NIC, IEEE 1394 adaptor or a USB 3.0 port on a third-party PC. MXRT0000D00000 Distributed MIL/MIL-Lite 10 package for master or slave node. Not needed if used within the same physical system. MXRTM2B2B2B000 All MIL 10 packages. MXRTM2B2B2BZ00 All MIL 10 packages. MILRTIDCMC MIL/MIL-Lite run-time USB hardware fingerprint and license storage. Replaces Matrox Imaging hardware as the fingerprint used to generate the unique system code. (see Software License Keys for available selections).